I took my first trip in recent history into the Sci/Fi section of the bookstore. After seeing the movie “Coraline,” I decided Sci-Fi or not, I was going to read a Neil Gaiman book. 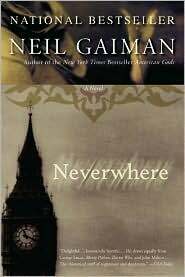 It took me about two sittings with Neverwhere before I finally shook the feeling that someone had slipped me a Harry Potter. But from then on, smooth Sci-Fi sailing. Neverwhere stars Richard Mayhew, a guy with a job and a troll doll collection he keeps on his desk at work, and a bossy fiance who drags him around malls and museums. They are on their way to an important dinner function when Richard stops to help a bloody mess-of-a-girl who is on the sidewalk. His fiance insists they don’t have time to help her, gives him an ultimatum, and flounces off to dinner without Richard. He helps the girl, and in doing so learns about talking rats and an entire civilization of people, superhero-like characters, villains, and animals living below London. When Richard tries to return to his normal lifestyle, back above ground, there is a glitch and he is no longer recognized or noticed. And he has gained some enemies. He heads back to London Below to do one of those whacky, Sci-Fi, “Goonies,” Lord of the Rings journeys that includes monsters and magic and a hierarchy of who’s who and who can do what. This isn’t a tough book. It doesn’t make you dig through the language for secret meanings. It doesn’t feel like the characters were over-plotted, they are pretty one-dimensional. But keeping them shallow allows for good humor. The bumbling killer who takes every word literally is my favorite. But every character that is introduced — and there are plenty — has a clownish tick. Also fantastic: The running journal Richard writes in his head; When the two main characters get drunk on half a glass of wine. It’s all very cute and easy and hits that perfect middle ground where everything is described well enough to see it, but not so well that the life is sucked out of it. There is something great about fiction with no rules or boundaries or limitations. Huh. Sci-Fi. Who knew?